1 A None No Power Seat 1 A is a First Class seat. The First Class seats are closed private suites, each equipped with an electrical sliding door, a personal mini bar, adjustable ambient lighting, and its own vanity table, mirror, and wardrobe. The seats convert to a fully flat bed with a mattress. 1 E None No Power Seat 1 E is a First Class seat. The First Class seats are closed private suites, each equipped with an electrical sliding door, a personal mini bar, adjustable ambient lighting, and its own vanity table, mirror, and wardrobe. The seats convert to a fully flat bed with a mattress. 1 F None No Power Seat 1 F is a First Class seat. The First Class seats are closed private suites, each equipped with an electrical sliding door, a personal mini bar, adjustable ambient lighting, and its own vanity table, mirror, and wardrobe. The seats convert to a fully flat bed with a mattress. 1 K None No Power Seat 1 K is a First Class seat. The First Class seats are closed private suites, each equipped with an electrical sliding door, a personal mini bar, adjustable ambient lighting, and its own vanity table, mirror, and wardrobe. The seats convert to a fully flat bed with a mattress. 11 A None No Power Seat 11 A is a Business Class seat where the noise from the more crowded Economy cabin may be bothersome. 11 B None No Power Seat 11 B is a Business Class seat where the noise from the more crowded Economy cabin may be bothersome. 11 D None No Power Seat 11 D is a Business Class seat where the noise from the more crowded Economy cabin may be bothersome. 11 E None No Power Seat 11 E is a Business Class seat where the noise from the more crowded Economy cabin may be bothersome. 11 F None No Power Seat 11 F is a Business Class seat where the noise from the more crowded Economy cabin may be bothersome. 11 J None No Power Seat 11 J is a Business Class seat where the noise from the more crowded Economy cabin may be bothersome. 11 K None No Power Seat 11 K is a Business Class seat where the noise from the more crowded Economy cabin may be bothersome. 17 A None No Power Seat 17 A is a standard Economy Class Bulkhead seat. The tray table is in the armrest, making the armrest immovable and slightly reducing seat width. There is no floor storage for this seat during take-off or landing. There is a bassinet location here, so passengers traveling with infants are often seated in this row. 17 B None No Power Seat 17 B is a standard Economy Class Bulkhead seat. The tray table is in the armrest, making the armrest immovable and slightly reducing seat width. There is no floor storage for this seat during take-off or landing. There is a bassinet location here, so passengers traveling with infants are often seated in this row. 17 C None No Power Seat 17 C is a standard Economy Class Bulkhead seat. The tray table is in the armrest, making the armrest immovable and slightly reducing seat width. There is no floor storage for this seat during take-off or landing. There is a bassinet location here, so passengers traveling with infants are often seated in this row. 17 D None No Power Seat 17 D is a standard Economy Class Bulkhead seat. The tray table is in the armrest, making the armrest immovable and slightly reducing seat width. There is no floor storage for this seat during take-off or landing. There is a bassinet location here, so passengers traveling with infants are often seated in this row. 17 E None No Power Seat 17 E is a standard Economy Class Bulkhead seat. The tray table is in the armrest, making the armrest immovable and slightly reducing seat width. There is no floor storage for this seat during take-off or landing. There is a bassinet location here, so passengers traveling with infants are often seated in this row. 17 F None No Power Seat 17 F is a standard Economy Class Bulkhead seat. The tray table is in the armrest, making the armrest immovable and slightly reducing seat width. There is no floor storage for this seat during take-off or landing. There is a bassinet location here, so passengers traveling with infants are often seated in this row. 17 G None No Power Seat 17 G is a standard Economy Class Bulkhead seat. The tray table is in the armrest, making the armrest immovable and slightly reducing seat width. There is no floor storage for this seat during take-off or landing. There is a bassinet location here, so passengers traveling with infants are often seated in this row. 17 H None No Power Seat 17 H is a standard Economy Class Bulkhead seat. The tray table is in the armrest, making the armrest immovable and slightly reducing seat width. There is no floor storage for this seat during take-off or landing. There is a bassinet location here, so passengers traveling with infants are often seated in this row. 17 J None No Power Seat 17 J is a standard Economy Class Bulkhead seat. The tray table is in the armrest, making the armrest immovable and slightly reducing seat width. There is no floor storage for this seat during take-off or landing. There is a bassinet location here, so passengers traveling with infants are often seated in this row. 17 K None No Power Seat 17 K is a standard Economy Class Bulkhead seat. The tray table is in the armrest, making the armrest immovable and slightly reducing seat width. There is no floor storage for this seat during take-off or landing. There is a bassinet location here, so passengers traveling with infants are often seated in this row. 2 A None No Power Seat 2 A is a First Class seat. The First Class seats are closed private suites, each equipped with an electrical sliding door, a personal mini bar, adjustable ambient lighting, and its own vanity table, mirror, and wardrobe. The seats convert to a fully flat bed with a mattress. 2 E None No Power Seat 2 E is a First Class seat. The First Class seats are closed private suites, each equipped with an electrical sliding door, a personal mini bar, adjustable ambient lighting, and its own vanity table, mirror, and wardrobe. The seats convert to a fully flat bed with a mattress. There is a bassinet location here, so passengers traveling with infants are often seated in this row. 2 F None No Power Seat 2 F is a First Class seat. The First Class seats are closed private suites, each equipped with an electrical sliding door, a personal mini bar, adjustable ambient lighting, and its own vanity table, mirror, and wardrobe. The seats convert to a fully flat bed with a mattress. There is a bassinet location here, so passengers traveling with infants are often seated in this row. 2 K None No Power Seat 2 K is a First Class seat. The First Class seats are closed private suites, each equipped with an electrical sliding door, a personal mini bar, adjustable ambient lighting, and its own vanity table, mirror, and wardrobe. The seats convert to a fully flat bed with a mattress. 21 A None No Power Seat 21 A is an Economy Class seat where the close proximity to the lavatory might be bothersome. This seat also has limited recline. 21 B None No Power Seat 21 B is an Economy Class seat where the close proximity to the lavatory might be bothersome. This seat also has limited recline. 21 C None No Power Seat 21 C is an Economy Class seat where the close proximity to the lavatory might be bothersome. This seat also has limited recline. 21 D None No Power Seat 21 D is an Economy Class seat where the close proximity to the lavatory might be bothersome. This seat also has limited recline. 21 E None No Power Seat 21 E is an Economy Class seat where the close proximity to the lavatory might be bothersome. This seat also has limited recline. 21 F None No Power Seat 21 F is an Economy Class seat where the close proximity to the lavatory might be bothersome. This seat also has limited recline. 21 G None No Power Seat 21 G is an Economy Class seat where the close proximity to the lavatory might be bothersome. This seat also has limited recline. 21 H None No Power Seat 21 H is an Economy Class seat where the close proximity to the lavatory might be bothersome. This seat also has limited recline. 21 J None No Power Seat 21 J is an Economy Class seat where the close proximity to the lavatory might be bothersome. This seat also has limited recline. 21 K None No Power Seat 21 K is an Economy Class seat where the close proximity to the lavatory might be bothersome. This seat also has limited recline. 23 D None No Power Seat 23 D is an Economy Class Exit Row seat with extra legroom. The tray table is in the armrest, making the armrest immovable and slightly reducing seat width. There is no floor storage for this seat during take-off and landing. The close proximity to the lavatories may be bothersome. There is a bassinet location here, so passengers traveling with infants are often seated in this row. 23 E None No Power Seat 23 E is an Economy Class Exit Row seat with extra legroom. The tray table is in the armrest, making the armrest immovable and slightly reducing seat width. There is no floor storage for this seat during take-off and landing. The close proximity to the lavatories may be bothersome. There is a bassinet location here, so passengers traveling with infants are often seated in this row. 23 F None No Power Seat 23 F is an Economy Class Exit Row seat with extra legroom. The tray table is in the armrest, making the armrest immovable and slightly reducing seat width. There is no floor storage for this seat during take-off and landing. The close proximity to the lavatories may be bothersome. There is a bassinet location here, so passengers traveling with infants are often seated in this row. 23 G None No Power Seat 23 G is an Economy Class Exit Row seat with extra legroom. The tray table is in the armrest, making the armrest immovable and slightly reducing seat width. There is no floor storage for this seat during take-off and landing. The close proximity to the lavatories may be bothersome. There is a bassinet location here, so passengers traveling with infants are often seated in this row. 24 H None No Power Seat 24 H is an Economy Class Exit Row seat with extra legroom. The tray table is in the armrest, making the armrest immovable and slightly reducing seat width. There is no floor storage for this seat during take-off and landing. 24 J None No Power Seat 24 J is an Economy Class Exit Row seat with extra legroom. The tray table is in the armrest, making the armrest immovable and slightly reducing seat width. There is no floor storage for this seat during take-off and landing. 24 K None No Power Seat 24 K is an Economy Class Exit Row seat with extra legroom. The tray table is in the armrest, making the armrest immovable and slightly reducing seat width. There is no floor storage for this seat during take-off and landing. 36 A None No Power Seat 36 A is an Economy Class seat where the close proximity to the lavatory and galley might be bothersome. 36 B None No Power Seat 36 B is an Economy Class seat where the close proximity to the lavatory and galley might be bothersome. 36 C None No Power Seat 36 C is an Economy Class seat where the close proximity to the lavatory and galley might be bothersome. This seat is often bumped into by other passengers and flight crew. 36 D None No Power Seat 36 D is an Economy Class seat where the close proximity to the lavatory and galley might be bothersome. 36 E None No Power Seat 36 E is an Economy Class seat where the close proximity to the lavatory and galley might be bothersome. 36 F None No Power Seat 36 F is an Economy Class seat where the close proximity to the lavatory and galley might be bothersome. 36 G None No Power Seat 36 G is an Economy Class seat where the close proximity to the lavatory and galley might be bothersome. 36 H None No Power Seat 36 H is an Economy Class seat where the close proximity to the lavatory and galley might be bothersome. This seat is often bumped into by other passengers and flight crew. 36 J None No Power Seat 36 J is an Economy Class seat where the close proximity to the lavatory and galley might be bothersome. 36 K None No Power Seat 36 K is an Economy Class seat where the close proximity to the lavatory and galley might be bothersome. 37 A None No Power Seat 37 A is an Economy Class Exit Row seat with extra legroom. The tray table is in the armrest, making the armrest immovable and slightly reducing seat width. There is no floor storage for this seat during take-off and landing. The close proximity to the lavatories and galley may be bothersome. 37 B None No Power Seat 37 B is an Economy Class Exit Row seat with extra legroom. The tray table is in the armrest, making the armrest immovable and slightly reducing seat width. There is no floor storage for this seat during take-off and landing. The close proximity to the lavatories and galley may be bothersome. 37 C None No Power Seat 37 C is an Economy Class Exit Row seat with extra legroom. The tray table is in the armrest, making the armrest immovable and slightly reducing seat width. There is no floor storage for this seat during take-off and landing. The close proximity to the lavatories and galley may be bothersome. 37 H None No Power Seat 37 H is an Economy Class Exit Row seat with extra legroom. The tray table is in the armrest, making the armrest immovable and slightly reducing seat width. There is no floor storage for this seat during take-off and landing. The close proximity to the lavatories and galley may be bothersome. 37 J None No Power Seat 37 J is an Economy Class Exit Row seat with extra legroom. The tray table is in the armrest, making the armrest immovable and slightly reducing seat width. There is no floor storage for this seat during take-off and landing. The close proximity to the lavatories and galley may be bothersome. 37 K None No Power Seat 37 K is an Economy Class Exit Row seat with extra legroom. The tray table is in the armrest, making the armrest immovable and slightly reducing seat width. There is no floor storage for this seat during take-off and landing. The close proximity to the lavatories and galley may be bothersome. 38 D None No Power Seat 38 D is an Economy Class Exit Row seat with extra legroom. The tray table is in the armrest, making the armrest immovable and slightly reducing seat width. There is no floor storage for this seat during take-off and landing. There is a bassinet location here, so passengers traveling with infants are often seated in this row. 38 E None No Power Seat 38 E is an Economy Class Exit Row seat with extra legroom. The tray table is in the armrest, making the armrest immovable and slightly reducing seat width. There is no floor storage for this seat during take-off and landing. There is a bassinet location here, so passengers traveling with infants are often seated in this row. 38 F None No Power Seat 38 F is an Economy Class Exit Row seat with extra legroom. The tray table is in the armrest, making the armrest immovable and slightly reducing seat width. There is no floor storage for this seat during take-off and landing. There is a bassinet location here, so passengers traveling with infants are often seated in this row. 38 G None No Power Seat 38 G is an Economy Class Exit Row seat with extra legroom. The tray table is in the armrest, making the armrest immovable and slightly reducing seat width. There is no floor storage for this seat during take-off and landing. There is a bassinet location here, so passengers traveling with infants are often seated in this row. 44 C None No Power Seat 44 C is an Economy Class seat that is often bumped into by other passengers and crew members passing by. 44 H None No Power Seat 44 H is an Economy Class seat that is often bumped into by other passengers and crew members passing by. 46 A None No Power Seat 46 A is a standard Economy Class seat however, the tray table is in the armrest, making the armrest immovable and slightly reducing seat width. 46 B None No Power Seat 46 B is a standard Economy Class seat however, the tray table is in the armrest, making the armrest immovable and slightly reducing seat width. 46 J None No Power Seat 46 J is a standard Economy Class seat however, the tray table is in the armrest, making the armrest immovable and slightly reducing seat width. 46 K None No Power Seat 46 K is a standard Economy Class seat however, the tray table is in the armrest, making the armrest immovable and slightly reducing seat width. 49 A None No Power Seat 49 A is an Economy Class seat in the last row of the plane that may have limited recline. The close proximity to the lavatories and galley may be bothersome. 49 B None No Power Seat 49 B is an Economy Class seat in the last row of the plane that may have limited recline. The close proximity to the lavatories and galley may be bothersome. 49 D None No Power Seat 49 D is an Economy Class seat in the last row of the plane that may have limited recline. The close proximity to the lavatories and galley may be bothersome. 49 E None No Power Seat 49 E is an Economy Class seat in the last row of the plane that may have limited recline. The close proximity to the lavatories and galley may be bothersome. 49 F None No Power Seat 49 F is an Economy Class seat in the last row of the plane that may have limited recline. The close proximity to the lavatories and galley may be bothersome. 49 G None No Power Seat 49 G is an Economy Class seat in the last row of the plane that may have limited recline. The close proximity to the lavatories and galley may be bothersome. 50 J None No Power Seat 50 J is an Economy Class seat in the last row of the plane that may have limited recline. The close proximity to the lavatories and galley may be bothersome. 50 K None No Power Seat 50 K is an Economy Class seat in the last row of the plane that may have limited recline. The close proximity to the lavatories and galley may be bothersome. 6 D None No Power Seat 6 D is a standard Business Class seat. There is a bassinet location here, so passengers traveling with infants are often seated in this row. 6 E None No Power Seat 6 E is a standard Business Class seat. There is a bassinet location here, so passengers traveling with infants are often seated in this row. 6 F None No Power Seat 6 F is a standard Business Class seat. There is a bassinet location here, so passengers traveling with infants are often seated in this row. 7 A None No Power Seat 7 A is a Business Class seat with a misaligned window. The close proximity to the lavatories and galley may be bothersome. 7 B None No Power Seat 7 B is a Business Class seat where the close proximity to the lavatories and galley may be bothersome. 7 D None No Power Seat 7 D is a Business Class seat where the close proximity to the lavatories and galley may be bothersome. 7 E None No Power Seat 7 E is a Business Class seat where the close proximity to the lavatories and galley may be bothersome. 7 F None No Power Seat 7 F is a Business Class seat where the close proximity to the lavatories and galley may be bothersome. 7 J None No Power Seat 7 J is a Business Class seat where the close proximity to the lavatories and galley may be bothersome. 7 K None No Power Seat 7 K is a Business Class seat with a misaligned window. The close proximity to the lavatories and galley may be bothersome. 8 A None No Power Seat 8 A is a Business Class seat where the close proximity to the lavatories and galley may be bothersome. 8 B None No Power Seat 8 B is a Business Class seat where the close proximity to the lavatories and galley may be bothersome. 8 D None No Power Seat 8 D is a Business Class seat where the close proximity to the lavatories and galley may be bothersome. There is a bassinet location here, so passengers traveling with infants are often seated in this row. 8 E None No Power Seat 8 E is a Business Class seat where the close proximity to the lavatories and galley may be bothersome. There is a bassinet location here, so passengers traveling with infants are often seated in this row. 8 F None No Power Seat 8 F is a Business Class seat where the close proximity to the lavatories and galley may be bothersome. There is a bassinet location here, so passengers traveling with infants are often seated in this row. 8 J None No Power Seat 8 J is a Business Class seat where the close proximity to the lavatories and galley may be bothersome. 8 K None No Power Seat 8 K is a Business Class seat where the close proximity to the lavatories and galley may be bothersome. Every seat is equipped with a regular 110v AC power port in First Class and Business. It is possible that some versions of this aircraft will not have power ports. Emirates operates their 777-300 aircraft in three different configurations. This version operates in a three class layout and reflects the newest configuration and retrofit of this aircraft type. To verify the correct version of this aircraft at the time of booking or at online check-in, you can use these rows as a reference; First Class Rows are Rows 1-2; Business Class are rows 6-11; and Economy Class are Rows 17-50 with 304 seats. You can also Click here for Emirates' online tool to identify operating aircraft type by flight or route. 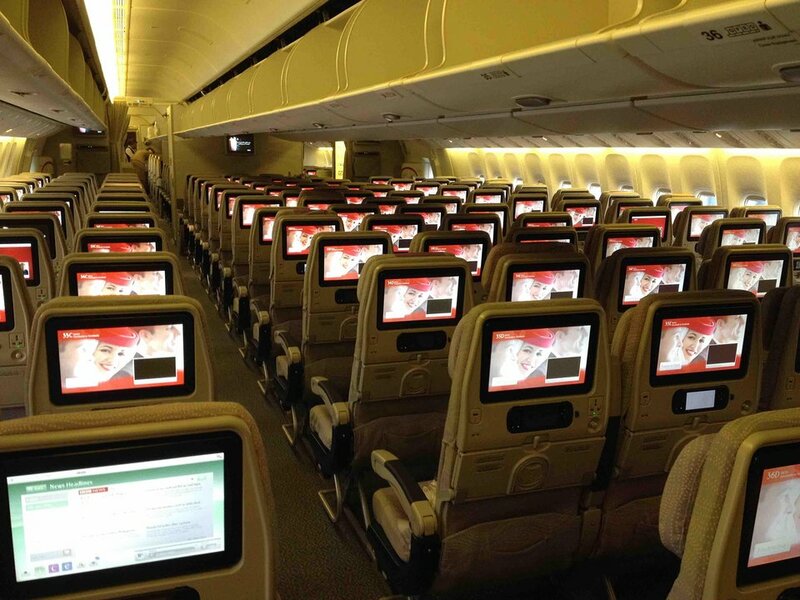 In this newest version of the 777-300, all classes feature Emirates ICE inflight entertainment system. The First Class has closed private suites, each equipped with an electrically operated sliding door, a personal mini-bar, adjustable ambient lighting, and its own vanity table, mirror and wardrobe. The seats convert to a fully flat bed with a mattress. The Business Class has angled lie-flat seats. Excellent Seat, Comfortable for long haul, plenty of room and good privacy. Exceptional food and service. Overall a not bad seat in the little mini cabin at the front. I will add that whilst 20D didn't have a universal power socket (but did have a USB port), 20E did. I didn't check the other rows, but I would assume that most rows would have a similar set up. I'm really surprised by the negative reviews that this (and similar seats) receive. The first aisle twin seat on a 777 is my absolute favorite seat to fly in. Not only are you in a twin row, but there is an extra seat ahead of you, giving you more room to spread out. I was able to put my carry-on under the extra seat, allowing me tons of space for my feet in front of me. Considering this plane already has plenty of legroom, I was extremely comfortable. As stated, the armrest is fixed with the tray table inside of it, but that never bothered me. Besides, the armrest tray tables are more adjustable that the ones fixed to the seat back. I will continue to book this seat on all flights that have it available. Never flying them again. 10-abreast seating on a 777 is just insane. Not only are the seats too narrow, the aisles are also narrower which means everybody passing by is bumping into you. The worst part was that Emirates does not allow you to look at seat availability before CHECKING IN, so even if you have a refundable fare, it's too late to change it by the time you realize how badly you've been had. This was an emergency trip so I didn't have time to shop around, but I'm never flying Emirates again as a matter of principle. Not for big people. There's a deteal in the design of tje the window that will be not comfortable to your arms. All the excellent facilities of Emirates first class on the A380 are available on the 777, except the toilets are much smaller. The staff, service, food, and wines reflect, as always with Emirates, a first class experience. Seat 2A highly recommended. When we booked this flight was to be operated by A380 we were unaware of the change until boarding, which was a shambles. noise from economy and crying babies very disturbing.Economy passengers coming through Business cabin to use our toilets, unchecked by cabin staff!! Our crew were worst I have experienced in an Emirates Business Cabin. Minimal service and clearing of rubbish. This A/c should not operate a 14 hour flight it's not suitable. I agree the seat by the exit whilst you are benefiting with the extra legroom the trade off is that you are very cold requiring a blanket to stay warm, the seat is very narrow and there is little or no cushioning making it very difficult to sleep or even stay comfortable sitting up. The 10 abreast seating in economy is a poor choice by Emirates compared to the 9 abreast seating used by other airlines. I will never fly again on a 10 a abreast seating Boeing 777. The seat itself was fine, but there was a plastic box built in to the underneath of the seat in front, meaning there is insufficient space to store your bag, or properly stretch your feet out. This seat has limited legroom and under-seat storage. The leg of the seat in 26 is in the middle of the leg/bag space. Lovely leg room, there is enough space in front (around 7-8 feet). If you want to maximize the entertainment with ICE then you may want to go back because the TV has to be stowed away much earlier when landing or later during take-off. No access to any seat pocket so the Air-hostess will hold your blanket and pillow for you. Enjoy the best seat in Economy. This seat has a fixed armrest. First time flying with Emerates - Adelaide to Orlando Via Dubai and I must say over all very impressive. I am 6'3 and comfort value and service is what I look for when I fly and they delivered. Surprised by the amount of leg room in economy we were able to stretch out in the seat and get some good zzz's. I had a good half a foot between my knee and the seat in front . Food was just OK on the way over - but improved on the return flight. Kids meal was OK loaded with sugar pancakes / waffles etc. Service very good - Drink service very good - will fly again. Seat 24K is terrible. The frame around the door will push into your right thigh making it impossible to stretch your legs out directly in front of you. You end up twisted with your legs in front of 24J. Do not pay extra for this seat. Emirates know this as they have added padding on the door frame to make life slight more comfortable! Seats 24H and 24J are better. The space is huge in front but people often gather here waiting for the toilet. I flew business boston to dubai on dec 14, 2017 and the plane they used was very old and dated. four of us flew business and were very disappointed at the aging plane. the leg from dubai to delhi was amazing, brand new with all the bells and whistles. i don't recommend emirates flight ek238 from boston to delhi, pick another airline for that leg. seat is angled flat not completely flat. kids meal terrible. staff was excellent and regular meals good. internet didn't work entire flight. Business Class, Athens to Dubai, no window felt claustrophobic would rather have sat in Economy with a window. Sept 17. This is possibly the worst seat on the aircraft. As the isle narrows due to the addition of the 3rd seat (46C), everyone coming from the rear of the aircraft moves to the right and hits the shoulder and arm of the passenger in 46D, including cabin crew. I took a beating for 13.5 hours. We were pleasantly surprised to find that there was both an electric (US) outlet and USB outlet at our seats. There was only one outlet for the 2 seats D and E, but we could share, and it certainly made working on our computers for the 14 hour flight possible. Continue to be impressed with Emirates Business Class. Would recommend rows 6 or 7 due to the reduced foot traffic (noise from the galley is not an issue however request ear plugs if you do hear anything). One note on row 6, unless you are an Emirates FF, you will have to request these seats at the airport. This seat has a partial window and is not the same as other window seats in economy. Aisle seat left of aircraft. Good service from Emirates. Newer aircraft. Good choice of entertsinment on ICE. Although volume output on provided headphones low, difficult to hear. 1x meal on day UK-Dubai flight. No power outlet on seats in this position. No other issues. Emirates have a great first class product here, much better than Qantas. Seat 1A was fantastic, in fact you can't go wrong with any of the first class seats. The only negative was the ICE entertainment system as it was difficult to operate - outdated. As QF CL and Platinum one we couldn't get any other seat allocation in Business other than 8 A and B. WE boarded at 2.30 am for a 7 hour Singapore flight. We slept most of the way but it was diificult in 8B as there was a constant flow of staff and passaengers heading for the galley and toilet. Also the ICE entertainment system was difficult to operate. I would suggest row 9 next time. There is no way to sit in this seat (and I imagine the same for 36H) without getting hit in the elbow or knee by the carts as they go by and/or shoulder by people walking by. Avoid this seat at all costs. The recline appears to be normal. I don't do a lot of long haul flying but when I do, I use business class. This Emirates flight was disappointing to say the least and not a patch on the Etihad flight in the same aircraft that I went on the last time I went to Dubai. The seats are just not very comfortable. They have three settings and, apart from the take off setting, the other two just don't do it for me. In the recline position they just don't feel right and in the sleep position they are too short (I'm only 6'-0 - not that big these days), don't recline a full 180 degrees and the hostess has to bring you a mattress. Whilst they were just ok for a 7 hour hop from Manchester to Dubai I wouldn't be happy on a 15 hour overnight from Dubai to Sydney. Anything else? The hostesses were good but just two choices of wine and a middling food quality didn't add to this expensive experience. I look forward to the A380 on my return. I'm definitely flying Etihad next time. Watch out for rows 7 and 8 in Business Class! They are right in front and in back of the galley and business class toilets. There is a lot of noise from the galley area all the time. Best row in Business Class on this plane is row 10. I would say bulkhead row 6 would be second best, as First Class is in front of the partition. The 3500+ channels of entertainment (movies, TV, music, etc) is AWESOME!!!!! Outdated aircraft. Limited legspace (I'm not a giant 1,81m). Traytable was laying on my legs! Extremely big amount of waste on the meals! Not acceptable! Being 6'3" & broad-shouldered the seats were narrow and uncomfortable. Major mechanical issues with my wife's seat (8A) resulted in a non-declining flight of 12hrs. The ICE only contained movies that were 6+ months old and the resolution of the screens is dismal compared to the modern carriers. Quality of the business class meals has dropped substantially, but the alcohol is liberally applied...to numb reality. High cost for what you actually receive. Great ! 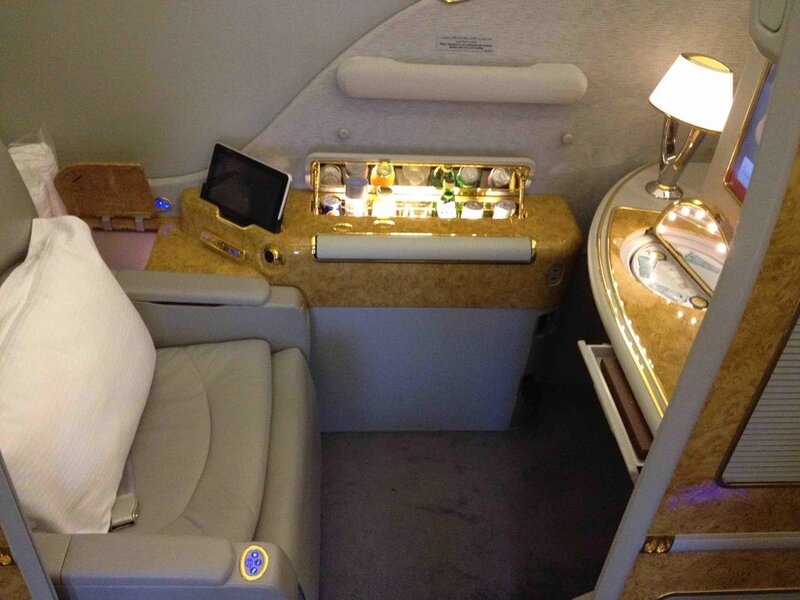 Emirates business class is pure leisure, every detail is perfect. Just one problem with the USB, the seat has two connections but both were out of order. This seat is good only exception being its close proximity to the restrooms. apart from that it is a very good pick. A large metal box underneath the seat in front restricted the amount of usable foot space by about 50%, so little room to shuffle around in. Inflight entertainment system also very dated, with an obviously old screen and controller that I remember using in the mid-2000s. Seat width just about adequate for a 185cm broad-shouldered man, but if you sit next to your twin expect to spend the flight clashing elbows. Probably the best choice if you have missed on the exit rows. Travelled recently between SEA & DXB. Had the 777-300ER which felt a little dated as compared to the 380 in the next leg of the journey. For these seats as well as 46 A&B, the arm rest between the seats are fixed. Also, watch out for the overhead space. There isn't much to spare. My husband & I had 8J & 8K from DUB to FRA. Monitor is actually on the wall in front of you in 8K so I had to wear my glasses to see the TV. Still enough to room to move around my hubby when he was sleeping in 8J. Wouldn't want to pick that seat if I was sitting next to a stranger though. Very good flight and service was great. Our staff member was very nervous .. but was professional. AVOID this aircraft. Ten seats abreast gang way so narrow always the trolley will connect with you, as will CC and passengers as they pass by. Cramped noisy full of screaming kids and people coughing, sneezing. By Cape town I has a sore throat and was also coughing.Unable to sleep or relax.Narrowist seat ever, limited recline. Never again for me. Having just come off the Emirates 380-800 flight which was spectacular (seat 20k) I found this experience to be a bit disappointing. The seat does flatten but is at a slight angle giving the feeling of potentially slipping off the seat. As this was a two seat line up I was blessed to not have a neighbour, but I did miss the cubicle experience of the 380. The staff were fantastic and incredibly helpful. The food and bar service was top class. The only downside was the seat 'horizontal' angle but apart from that the overall experience was good. This is a night flight from Phuket to Dubai, 777-300ER is a comfortable place in first class with the individual suites. I have also flown this route many times in Business class and that is also ok, it is possible to sleep without any problem. Service and food is ok but not as good as some of the other gulf carriers, but still well above European and US standards. I have travelled so much in this type of aircraft,theseats aretoo crumpy and tighned.2-your sw iss port crew most of the time very aerogant and rude to the passangers.As well as DHAkA airport.Management must lookinto the matter. I've flown most of Emirates A380V1 DXB-LAX RT and DXB-Mel round trip, The worlds best business class. 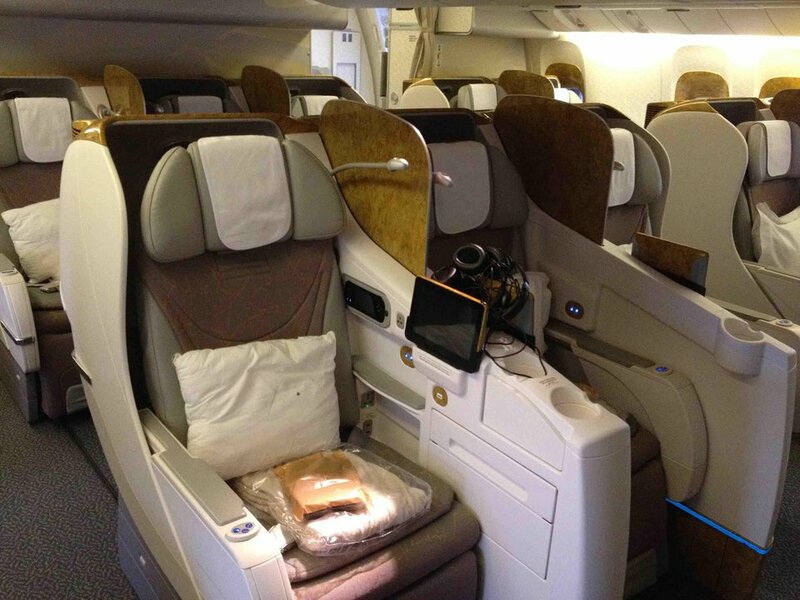 I also fly the B777V1 Business class quite frequently, RUH-DXB-ARN, round trip. No complaints on any of the seats. Coach is even good when flying short distances. You can't get this kind of service on British Airways, Air France, KLM, Lufthansa, American Airlines, United or Delta. I've also flown Etihad, fantastic service, and I like the fact that they have a US Customs station their. I can't comment on the Asian carriers because I haven't flown to any of their destinations. Business - 10G - Positive: Spacious cabin & seat and not claustrophobic (compared to A380). Got a toiletry kit!! The service in business class was poor. This was our first time travelling with Emirates and we were more than pleased with our seating arrangements and the service given us by the attendants. My travelling companion and I sat in seats 46J and 46K and we both remarked how comfortable and roomy our seating was, and that it definitely was an advantage to have the extra aisle room alongside. The staff were cheerful and friendly and any requests were quickly and efficiently dealt with. We will most certainly travel with Emirates again. When seat J is fully reclined into a flat bed position, the occupant of seat K cannot get out and around the reclined seat to reach the aisle without either climbing over the reclined person in seat J or asking that person to move their seat to an upright position,thereby allowing the window seat occupant access to the aisle. This is true with all window seats in Business Class except seats A & K in row 8. Probably the best seats in Business Class (along with A&B) because when seat J is fully reclined into a flat bed position, the occupant of seat K can still get out and around the reclined seat to reach the aisle. There isn't enough room if one occupies the center seat of the three center seats or window seats if the seats between them and the aisle are fully reclined. We flew Glasgow - Dubai Dubai - Delhi and return. On the Delhi - Dubai leg and the Glasgow - Dubai leg we had refurbished B777s and theybwere very comfortable and good TV size. On the other legs we had unrefurbished aircraft whcih felt kind of old and had small TV screens. On all the aircraft the crew were very nice and the food was great. I liked the mood lighting and te stars on the cieling that appear at night. I wish the seats didn't recline becasue there was comstantly a head almost kn my lap. Overall though a very giid plane and a very good airline. Rows 17 to 21 are good as it is almost like a separate cabin, away from the main part of economy. There's very little through traffic from other passengers and the meal service start in this part of the economy cabin. Row 21 not so good as seats don't fully recline. It was ok ,but I could do with a bit of extra room up the front when I put the tray out. My wife and I found these seats OK but business class on Emirates doesn't hold a candle to Cathay Pacific, Air France or British Air. Three issues. 1) reaching the electrical outlets and USB ports is difficult as they are located by one's hip in a cubby hole. In order to plug in, it's easiest to get out of one's seat and turn around to see what you're doing, 2) If the person in the aisle seat has their seat in the 'bed'position, the person in the window or center seat will have to crawl over that person to get to the aisle, 3) there is no privacy as one can see everyone from the passage way from First Class. The other airlines mentioned have seating that is 1-2-1, with private cubicles, and easier access to outlets. What's even worse is the 15,000 miles additional to fly Emirates. Won't do that again. My wife & I flew on 21st may dubai-seattle,14hrs&2o minutes non stop flight and we had a very comfortable journey.Food, service,ice in-flight entertainment were all good.will fly Emirates anytime. The seat is extremely uncomfortable, the 3:4:3 arrangement is definitely not suitable for 77W. The seats are rather cramp especially when the meals are served, you had to eat with one hand only otherwise you will keep bumping next passenger's hand. Legroom is ok. The whole 07 hours' journey was killing me! I just came off my first Emirates flight on a B773 ER, and it wasn't very pleasant. As predicted, 3-4-3 in Economy is a shocker. The aircraft I was on (sorry - forgot to take the reg.) had not been refurbished. The seat was very uncomfortable, narrow and had the black box for the AVOD partially obstructing my feet. It was also the DARKEST aircraft I've ever flown on. I flew 2 sectors, practically in pitch black. Why? When next I book, I'll only fly their A380 or, better still, just go QANTAS all the way. 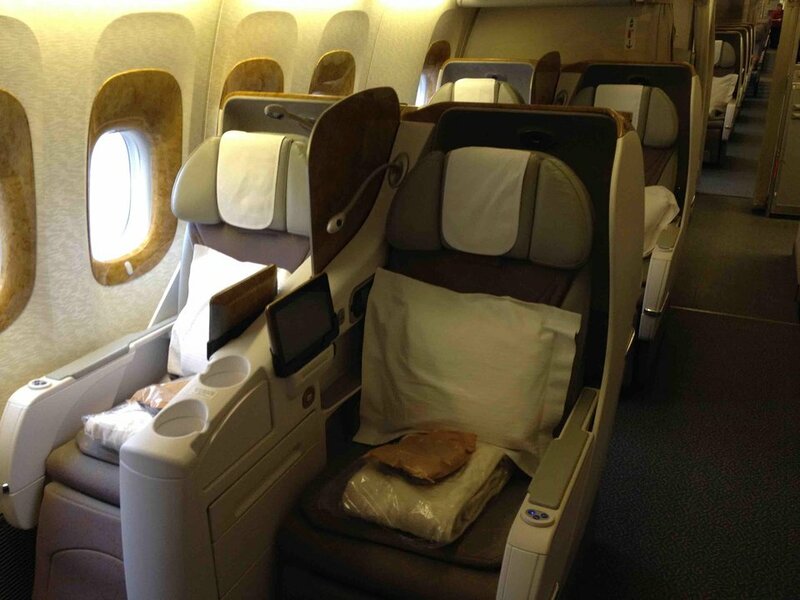 Travelled on 21 Mar 2015 (DXB-LGW - seats 31J,K)Very poor seating, disappointed in Emirates, they do a great job in Business and First but economy No - seat pitch poor very cramped for long-haul, cannot a eat meal if passenger in-front has their seat reclined. There is a box under the right hand side of 30K which means you cannot stretch your leg out, seat padding virtually non-existent - on an almost 8hr flight it was so uncomfortable - praying to get off at the end. If all 7770-300R window seats are like this then avoid them! Wished we had gone for rows 46-49 A,B,J,K as only 2 seats so can get out easily and not have to clamber over others. Even seats with extra legroom (front of cabin - not worth it as the toilets are close-by and other passengers stand in the 'extra legroom' area waiting to use them! Seats 6A and 6B are not as comfortable as the Business Class rows behind, because the TV screen is in a drop down box built into the side of the seat and is difficult to lift in and out and when set up for viewing, makes access in and out of the seat more difficult. SYD-CHC. The cabin, while a little gaudy, was clean and pleasant with excellent service from the cabin crew. Tables are huge with plenty of room to eat and work. ICE entertainment system is top-notch. Seat has lots of legroom and the recline/angle-lie is perfectly fine for shorter flights. However, the arm room in this seat is super cramped - if you have even slightly above-average shoulder/upper-body width you will be struggling with the lack of space on a longer flight. Not good for long flights 8+. There is a large metal bar under the seat in front leaving no room to stretch out legs when wanting to sleep. All seats of row 46 (A,B,J,K) very good leg space; only 2 seats on either side, wider aisle space, good window view, galley and toilet not too far and not disturbing. If you're flying business, avoid this seat. It's, for some reason, way more uncomfortable than all the others. Added to the close vicinity to the toilet, kitchen, and the fact that the TV is WAY smaller than the ones mounted on seats means that you will get off the plane grumpy. One of the most uncomfortable trips I have ever experienced. The seats are packed in with very little width and unreasonably close pitch. For an 8 hour flight, I expected better of Emirates. Not looking forward to the return trip. I flew the short sector from Christchurch to Sydney. Although not being on the long haul like some of my fellow passengers who were off to Dubai and Europe I still received great service from the cabin crew. The seat was technical but very comfortable and the meal I had was excellent. Large TV screen with lots of choice but I got through all that interested me in an hour. Well worth picking this flight for an amazing Trans Tasman experience as it's far superior to Business on the Qantas 737 for which this is a shared route. A long haul flight from SEA - DXB and my seat was fine. I'm a bit bigger than average but didn't feel squeezed in. I walk a lot during flights and with the 3x4x3 configuration you do have to pay attention not to bump into people but it wasn't horrible. A foot rest would have been a nice addition though. Service was friendly and attentive. Entertainment system and food was topnotch. Would fly again with them again. Tried Emirates for the first time after being impressed by the Business class experience- I will never fly again in Economy. - seats are too small. - on a long haul flight no bottles of water are given out. - food greasy - and when I asked for a cup of tea I was rudely told 'there's the galley' ! Great seats as no bothersome bumps from passing passengers/crew when in isle seat and being only two seats its easy to get up and walk around as often as we liked. The 3-4-3 economy config in the aircraft is terrible! I will never fly Emirates 777 economy again. i have flown the 777 with 3-3-3 config with CX & BA, a much better experience, far more comfortable and pleasant. Could actually get some sleep. Beware the zoning of the cabin. 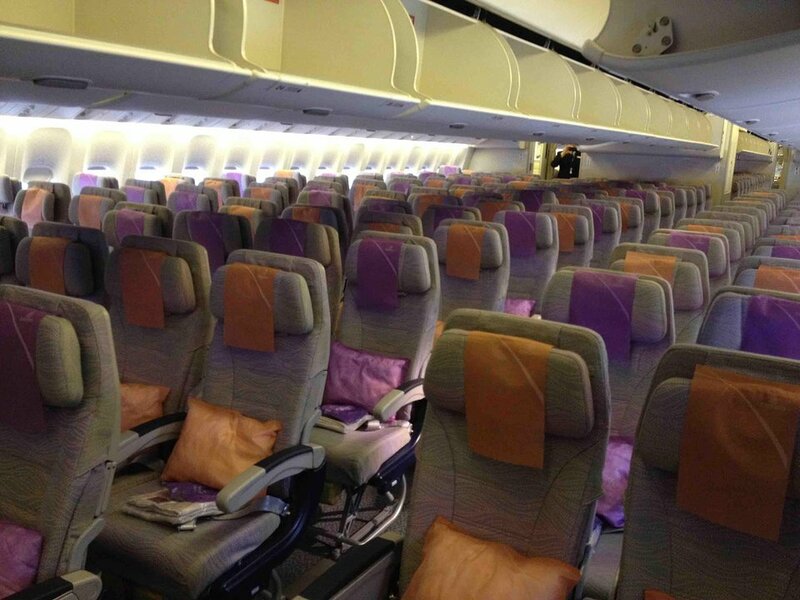 Despite being near the front of the cabin, on flight EK441 service starts in Row 27, Row 26 is the last to be served. This seat is great! Forward section of business, directly behind First, so no 'through traffic'. Seats in economy 3-4-3 are too narrow so always shoulder to shoulder pressing against the person in next seat. Aisle person gets bumped because aisles are so narrow. Do not expect to sleep. If someone uses the armrest the next person has to lean away or sit sideways just to fit in. This narrow seat should not be allowed especially on long-haul. I will never fly Emirates economy long-haul again. Sardines have more room. The reasonable food and ICE do not make up for horrible narrow seats. There is little noise from Y. And although being last served, this provides a view of the entire J cabin and, if aisle seat adjacent is vacant, can jump to lavs dduring meals before others do. Business class on the 777 is great. Some comments complain about seat width. I'm 6 ft tall, 215 pounds, and the seat is wide enough for me. Anyone complaining about width must be obese. I can see how anyone 250-pounds plus would have a hard time. Service is amazing. And I flight entertainment extensive. Very pleased. I have flown in this plane in economy class and the seats are very bad, i am 6 ft. Tall and my legs were paining after the flight also I had to bear my 16 hours of flight in such a small seat. The food though it was reasonable the snack items were horrible(full of oil). The best part is the beautiful Lighting and smooth takeoff/landing. I have flown twice on this Emirates aircraft in economy class. The ICE entertaiment system is very good and the food is reasonable. The seats are narrow but leg room was reasonable (I'm 1.82cm tall). I agree with other comments here that the biggest issue is the 3-4-3 economy class seating lay out. The isles are narrow and the in flight service is a real mission for the flight attendants. If you're in an isle seat expect your isle side shoulder and arm to be bumped regularly during the flight by flight attendants, trolleys and other passengers, much more so than on other aircraft. I also wonder about the effect the narrow isles and the extra 33 passengers would have on speed of evacuation in an emergency. Doubtful that I will fly this Emirates aircraft again. This is the worst Business Class configuration I have ever experienced. The width of the seats is extremely narrow which makes trying to sleep quite uncomfortable. The "box like" partitioning between seats leaves no room to sit other than directly forward. I have flown business class on this plane with other airlines and the difference in seat size is markedly different - but usually the business cofiguration is 2-2-2. The additional seat in the centre is the obvious difference. I will not fly Emirates on this plane again, although I understand from friends who have flown Emirates on the A380 have nothing but praise. Consider your seat choice carefully. I was on quite a few Emirates flight operated by B777-300ER and must say that I never had any problem with 3-4-3 configuration. I always have windows seat and I'm quite tall(177cm). The leg room is adequate and I was also able to stretch my legs using space under the seat in front on me. I'm rather slim so the wide of seat is for me perfectly ok. ICE and food was always great. I can not believe that anyone has anything positive to say about Emirates 3-4-3 seat configuration in the 777-300ER, I can only presume they viewed the economy cabin from the comfort of first class. The figures speak for themselves, this configuation has less seat width and spread than virtually any other airline in the world. It is so cramped that cabin crew can barely navigate trolleys up the narrow aisles, they must be hell on earth to work in. The 777 is not a bad aircraft, but it becomes a dreadful flying experience to have to spend 11 hours in a plane that was clearly designed to carry 50 less passengers than it is being asked to do. This aircraft is very good. It has also the new ICE Digital and it was real fun. The best aircraft I've ever flown with.